Hi, and welcome to my blog. The Manual DSLR Project was started March 30, 2010 with the intent of devoting one year to learning how to use my Nikon D300 in manual mode. I invited you to join me as I took this journey. You celebrated with me as my fingers began to remember which wheel adjusts the shutter speed and which controls the aperture settings. I was brutally honest in sharing my mistakes. A year passed quickly...and I achieved my goal of demystifying the manual operation of my camera. While the Manual DSLR Project was intended to be bound by time (one year), I am eager to keep the conversation going. So look for additional posts on anything related to photography. And interact. Let me know if you are reading the blog and find it useful. After many years of avoiding Facebook, I have established a new personal account. Please feel free to connect with me by clicking here. Last week I introduced my new business website. This week I want to invite you to connect with us on Twitter, Facebook and Linked In. These are new accounts so I am trying to build connections. Twitter - Our business Twitter is https://twitter.com/kennamermedia Please follow us and share this link with our followers. Linked In - You may also wish to follow our Linked In page by clicking here. I recently launched a new website for my business. Ready in time for 2015, the new site better represents our business and was designed to help promote our services to existing customers and to reach out to new customers. Please give it a look and let me know what you think. 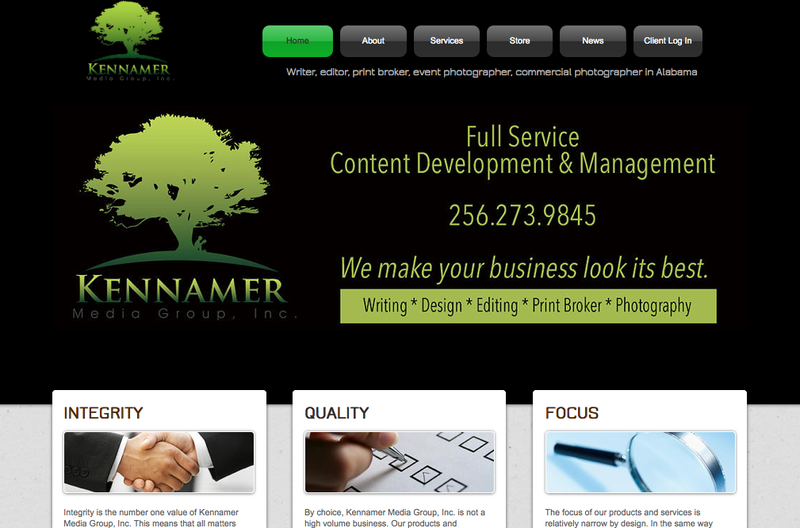 Be sure to check out our new site at KennamerMediaGroup.com and if you know anyone who is responsible for hiring freelancers for copywriting, photo acquisition, or graphic design, have them to contact us at info@kennamer.net. My last post included iPhone snapshots I took while on trips in 2014. You were asked to match the location with the photo. Here are the answers. This is the Bromo Seltzer Tower in Baltimore Maryland. It now anchors the corner of the nation's busiest fire station. This shot was taken just after we took off from Lubbock, Texas and shows the dust storms occurring below. This was made at Rehobeth Beach, Maryland during a June trip. I took this shot at St. Pete Beach, Florida as we watched the sunset. This section of the Berlin Wall was displayed in Portland, Maine. We stopped in at this Harvey's in Saint Theophile, QC. This was taken near the end of a quick trip to Dallas. The guy sitting in front of me had the flu. How time flies when you are having fun! 2014 has come and gone without any activity on the Manual DSLR site. Even so, people are still reading the articles. For that, I am appreciative. My resolution for this year is to revive The Manual DSLR site by posting at least one photography article per month. I've been quite busy with writing projects of late, and haven't taken the time to post anything about photography projects. See if you can match the iPhone snapshots below with the locations listed above. Some locations are not represented by photos. Answers will follow in a few days. This was the view from our hotel window. In what city will you find this iconic tower? This was taken just after we took off from a dusty, windy city. Guess which one. Which beach is this one? This was taken during the golden hour at one of our destinations. Which one? Where will you find this section of the Berlin wall? Harvey's anyone? In what city was this taken? This is the most exciting view I had on this business trip. I also came home with the flu.